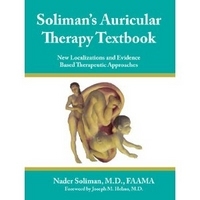 Soliman’s Auricular Therapy Textbook – Nader Soliman, M.D. Foreword by Joseph Helms, M.D. This textbook is considered the finest ever written in the field of auricular therapy! The scientific bases of the acupuncture microsystem with its three dimensional holographic presentation is discussed in detail to allow adequate understanding of the functional aptitude of the auricular acupuncture microsystem. The practice of the three-phase auricular therapy is invaluable in addressing many of the most difficult medical problems encountered in our time. The textbook offers unique approaches for treating common and unusual medical problems in a systematic manner. The textbook is invaluable for the proper practice of auricular therapy with its three-phase presentation and will offer exciting and effective means to address the pathology regardless of its duration and virulence. Soliman’s Auricular Therapy Textbook brings together background information and the detailed descriptions of the various auricular holographic projections and the recommended methodology for the proper identification of the sites of these projections. It also presents numerous and simple illustrations and sophisticated, evidence-based clinical approaches for treatment. Overall, this textbook reflects the outstanding work of Dr. Paul Nogier and other early pioneers, the knowledge of many outstanding teachers and clinicians, and the experience of the author in this fascinating field. In addition, this textbook offers the reader the most accurate localizations of the various organs and structures, along with new localizations identified by the author for the projection sites of structures that were never researched before.